A fall wedding means shopping gorgeous gowns for the perfect fit. Autumn brides have many amazing dress choices for this colorful season. Regardless if you opt for a traditional white, cream or brilliant fall leaf colored gown, the options are endless for style and design. An ivory, ecru, or other off-white wedding gown can be a beautiful and sophisticated option for a fall wedding. This color will especially stand out during an evening celebration when the rich colors of an autumn sunset set the sky ablaze. Many wedding dress designs include patterned lace, and for a fall gown choose a lace pattern that shows leaves or leaf-like shapes rather than spring buds or flowers. This will coordinate the texture of the bodice or train lace with the texture of the season all around. Autumn is a season filled with color, and many fall brides opt to add a bit of color to their wedding gowns. A sash is an easy way to add color, and fall hues such as chocolate brown, sage green, apple red, mustard yellow, and pumpkin orange are the most popular. Bronze and gold are other fantastic options for fall brides to choose as well. A bold bride might choose a colored wedding dress for her fall celebration. Red, yellow, orange, and brown are the most popular shades, and even the wedding veil, bridal shoes, and other accessories can be dyed to match. To avoid too much color, however, a bride wearing a colored dress might prefer ivory or white bridesmaid dresses for her attendants. With fall's bold colors and rich textures setting the scene for a beautiful wedding, a simple wedding dress with minimal accents can be a beautiful choice without being overwhelming. A less-ornate style is an especially good option for second weddings or mature brides who prefer a simpler dress. Autumn evenings can be crisply cool, and long-sleeved wedding dresses are popular fall choices. If the dress you adore doesn't come with sleeves, a lace bolero, satin shrug, or other wrap can be added easily. Corset wedding dresses are always popular, and it is easy to add a touch of fall color to the gown by using satin laces in a bold autumn shade. If the dress does not have colored laces, ask for a different ribbon to tighten the corset. Coordinating the lace color with the bridal party dresses is a great way to have a sophisticated look as well. Inset color on the skirt of a fall wedding dress will give the design a touch of color without overwhelming the senses. For a subtle addition of color, choose lighter shades such as sand, beige, or light gold and coordinate the color with beading on the bodice, around the neckline, or on the train. A wedding dress with a heavily textured skirt, ruched bodice, or other fabric details can be the perfect accompaniment to the rich colors of autumn, especially if a bride prefers a white dress without fall color details. Instead, the fabric details can add emphasis to the wedding dress. A two-tone skirt on a ball gown wedding dress can be a beautiful fall choice. The white bodice and upper portion of the skirt can be separated from an ivory or beige lower section of the skirt with leaf motif lace. The fabrics can also differ, such as using satin for the main portion of the dress but a shiny silk for the lower half. Autumn weather can be unpredictable, and a simple shawl, shrug, or draped wrap can be a versatile wedding dress accessory. The wrap may be the same color and fabric as the gown, or choose a bright fall color instead for contrasting accents that coordinate with bridal party dresses. Brides who plan to pose for outdoor photos for a fall wedding may want to choose a dress with a shorter train so it is not tangled or sullied by leaves, twigs, or other seasonal debris. A sweep or chapel train is still elegant but can be much more manageable on unpredictable terrain or in uncertain weather. Modest wedding dresses can be a perfect choice for fall brides because with higher scoop or bateau necklines and cap sleeves, they are generally more suited to cooler temperatures without being stifling. Halter dress designs are also favorite fall choices because they are chic and elegant but still seasonally appropriate. A very long wedding veil - falling to the calves or even to the ground - is an elegant accessory for a fall wedding and serves the additional purpose of another warm layer during a potentially chilly wedding ceremony or photo session. Long veils can also look stunning on the brilliant leaf background of fall trees. Ultimately, fall brides need to choose whatever wedding dress suits them best, while considering the temperatures, weather, and likely conditions during their celebration. Any wedding dress can be beautiful for a fall wedding, so long as the bride is confident and wears the dress well. In addition to choosing a seasonally appropriate wedding dress, fall brides need to consider other autumn details such as fall wedding flowers, the color of their bridal party dresses, autumn dishes for the reception menu, and an overall fall theme for their event. By tying all these details in with a fall wedding dress, the entire celebration will be beautifully coordinated for a beautiful season. No matter what fall dresses you consider or what you ultimately choose, the most important thing is to have fun at your wedding. Take time to enjoy the season and capture the love and excitement you and your beloved share, and your event - and attire - will be beautiful. 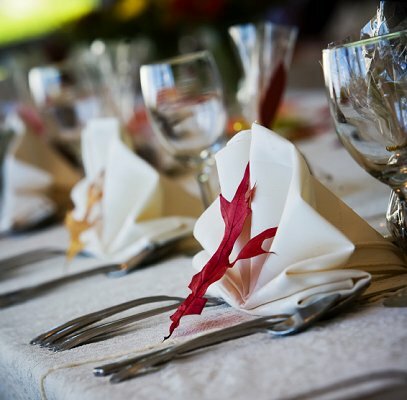 Check out these articles for more ideas for fall weddings. . .